A Matreshka is a small wooden painted doll in which there are some smaller copies of it. The first matreshka who was a round-faced average peasant girl wearing a three-cornered colored painted kerchief and a Russian national smart sarafan appeared not at all in ancient times. The first prototype of a matreshka was brought from Japan at the end of 19th century. It was statuettes of wise man Fukuruma which were put one in another. In Moscow toy shop a woodturner ground the first Russian matreshka out. The name Matreshka originated from the most famous then female name Matrena. That name was a symbol of fertility and associated with a mother of a large family. The first Russian matreskas consisted of eight statuettes of children of different ages up to new-born children. Now a Matreshka is a world-wide known traditional Russian souvenir. There are Matreshka’s museums all over Russia. You can learn its history and methods of its fabricating. Nowadays matreshkas with portraits of political leaders and matreshkas with different portraits are popular with foreigners. Matreshkas are put together according to different principles to suit its purpose which is to surprise. Interestingly enough, after creating the first children’s matreshka painters in different Russian districts began to paint matreshkas. Sergiev Posad, Semenov, Vyatka are ancient centers of handicrafts and a Matreshka helped them became famous. The principle and the technology of turning of matreshka’s blanks have remained practically unchangeable since those times when the first Russian matreshkas appeared. The least doll which is nonseparable is made first. Matreshkas are grounded before painting. After that they are varnished. Bright images are created with aniline colours, water-colours and tempera. A Matreshka’s face and an apron with a vivid image are painted in the first place and then it’s a sarafan and a kerchief’s turn. A Matreshka can hold in her arms a basket with berries and mushrooms, a bucket with water, sickle, etc. You can find a matreshka-bride, matreshka-of marriageable age and matreshka-old woman. You can say what place a matreshka was made in by its painting. A Matreshka is a generalized image of a Russian beauty celebrated in Russian fairytales and songs. A deep symbolic meaning of the toy is procreating, fertility and endlessness of life. These colourful separable wooden toys reflect regional features of life and the way of life. They are remarkable for their expressiveness and craftsmanship of design. 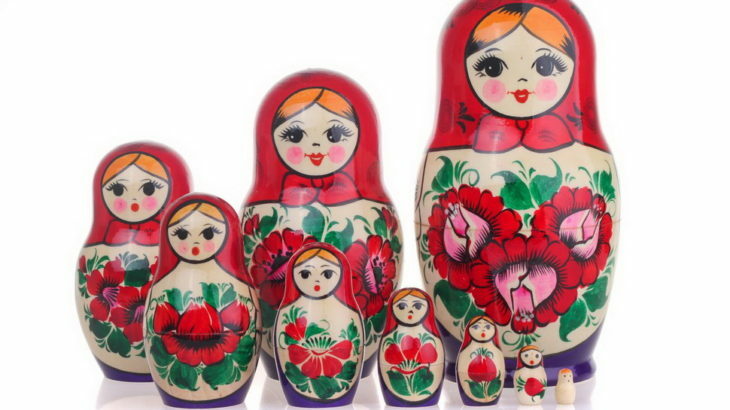 culture, Museums Russian doll name, russian nesting doll meaning, what is a matryoshka doll. permalink.